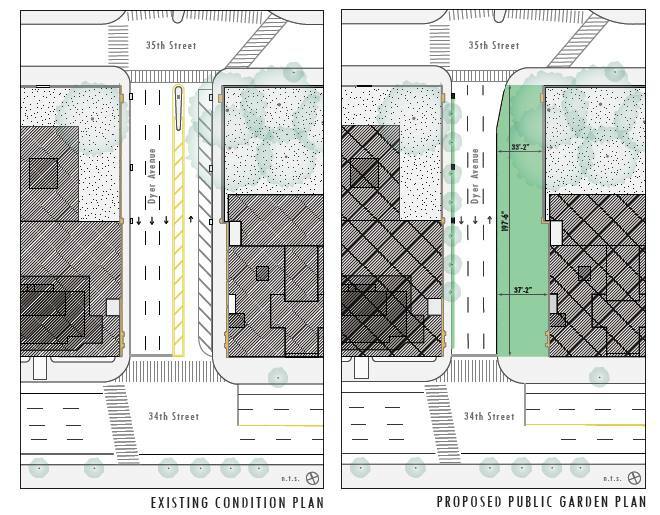 ← A Park on Dyer Avenue ? of adjoining buildings and organizations have joined forces to create a 7,000 sq. 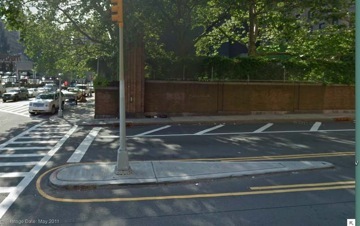 ft. park by reclaiming unused roadway on the east side of Dyer Avenue (9/10 Av.) between 34th and 35th Streets in Manhattan. We are seeking your help in executing this three-phase project. The first phase will take place in March 2013 and should cost $ 20,000. Currently on Dyer Avenue, the block between 34th and 35th Streets contains four moving lanes (3 southbound and 1 northbound) and 2 striped buffer lanes. As part of the Select Bus Service (SBS) installation on 34th Street, the New York City Department of Transportation (DOT) asked and the Port Authority of New York and New Jersey (PA) agreed to remove one lane of southbound traffic. This results in 3 moving lanes of traffic and 3 lanes of buffer . CHEKPEDS proposed to PA and PA is not opposed considering regrouping the moving lanes of traffic to the West and the buffer zones to the East, creating a significant area that can be converted to park. removed to properly align the north bound traffic lane with the next block. Such removal is estimated to cost $ 15 to 20,000. 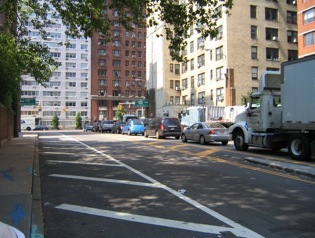 It should take place between March and May 2013, when the traffic lanes are restriped to coincide with the installation of the SBS on 34th Street. CONTRIBUTE HERE – all donations up to $ 7,500 are matched by a generous donor. You contributions are tax deductible and can be matched by your employer. JOIN US on January 17th, at (TBA) at the Benefit For Dyer Park. $ 25 minimum or free if you have already contributed. 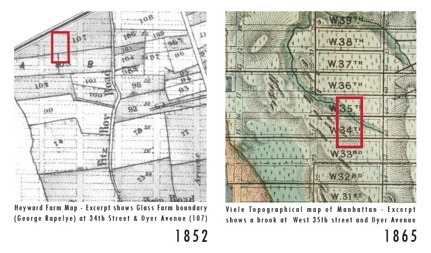 Ernest Modarelli, Resident of 9th Avenue at 36th Street, Member of Community Board 4. The committee met three times in a charrette format lead by Meta Brunzema, the architect who designed the HKNA plan and the greening plan of our neighborhood, to create a shared vision and vet the proposal, which is included herein. There will be further and wider community consultation once we get closer to implementation. The park will also draw upon and expose the rich history of this area since 1852 when the area was a farm until the demolition of four buildings in 1935 to make place for Dyer Avenue . This entry was posted in 9th Avenue Renaissance, Greening. Bookmark the permalink. Great idea! Great job all those of you who have been working so hard to accomplish this. We need more green in our neighborhood! Sorry I can’t be there for the meeting as I am out of town. I will be sending lots of green wishes. Keep growing, Rebecca Cole, resident of 433 west 34th. I’m so bummed about this project . For years all the motorcyclists including myself a long time resident of the neighborhood have had parking on Dyer Ave . If we park in the street next to cars our motorcycles get banged up and found lying in the gutter from cars vying for parking space. . Honestly with the high line extension, hudson river park and the new huge outdoor space being built into the brookfield properties project why screw over the local residents with motorcycles…who would want to hang out in the middle of the lincoln tunnel car traffic anyway…doesn’t seem very green or healthy to inhale the exhaust fumes. I hope the powers that be will find it in their hearts to provide free street parking for scooters and motorcyles.We are green too!!! We all agree Motorcycles should have way more parking. Chekpeds has supported and CB4 has sent letters to DOT to obtain such and we are ready to do it again. (this should be on the next agenda). DOT has not been responsive. There is an area north of the triangle across 36th Street, that can take 8 motorcycles, and one on 9th avenue between 36th adn 35th (north adjacent to the bike corral) that has a capacity of 5 motorcycles. Both are well protected. This community is ranked 57th out of 59 in the ratio of parks per resident. The triangle is part of a string of three green spaces from 36th and 9th avenue to 34th and dyer avenue that will be installed over time. Thank you for your prompt reply I applaud the wonderful work that Chekpeds has done for our community over the years. My concern is that the DOT and community board still have not addressed the issue of rationing a fair portion of parking for traffic friendly vehicles like scooters and motorcycles. During riding season there are up to 4o motorcycles and scooters that park on Dyer Ave. We now are reduced to at best 8 available spots on 9th ave as per the flyer.Additionally there’s no signage indicating it is legal for motorcyles to park . M/C and scooters maneuver about the streets much like bicycles, have very low emissions,don’t ever cause a gridlock pile up or poison the air quality like the hundreds of buses and commuter cars emit everyday outside my window on 10th ave. Couldn’t the new park plan incorporate a few parking spots for m/c’s too? I hear you loud and clear . We will work on this. Another possible location is the space north of the triangle, directly across 36th street. Approximately 8 bikes could fit there and it is protected. This is a beautiful park. I can’t wait to hang out in the middle of this traffic island, and watch cars and trucks whiz by, or stuck in traffic, while I’m relaxing sipping a raspberry peach mochaccino, soothed by the rumble of trucks and busses exiting the Lincoln Tunnel, while enjoying the delicate aroma of gasoline and diesel exhaust. This is a great step in eliminating motorcycles from Manhattan. Those who used to commute here by motorcycle and park in this now lovely park, should now find sufficient motivation to drive a normal, safe SUV instead. Like all major cities in the world, there is no room or place for motorcycles as a form of transportation, and the city should do more discourage these hooligans. For the residents who used to park motorcycles here, if they can afford $3500 a month for a studio apartment, they can afford to pay more for parking. I will see you all in the new park! I am glad you seem to like it (the sarcastic tone comes through loud and clear). We like motorcycles because they take way much less street space than cars and are less threatening to pedestrians . In fact I cannot recall the last time a pedestrian as killed by a motorcyclist. We have identified 12 parking slots for motorcycle on the area, north of the triangle, across 36th Street. If I was overly sarcastic it’s because for decades I’ve watched motorcycles being marginalized in NYC. Motorcycle parking spaces have been disappearing, and been replaced by nothing. In addition to the one removed here recently, there was once one at 36th and 9th (taken over by Midtown South Precinct), a very large one at Columbus Circle, a very large one North of Battery Park, one at Madison Square, to name just a few. It seems to me if commuters switched to motorcycles, it would lessen the gridlock that comes through the Lincoln Tunnel. New York should should look to other international cities for examples as to how motorcycling is managed. I realize this is not your function here. So forgive my disappointment at seeing this latest development. FWIW, I own a house in Brooklyn, and commute to 10th Ave using the subway, so the parking is a non-starter for me, but to see all the motorcycles kicked out for the purpose of this unattractive park is a bit of a let down. But all the same, I applaud your attempts to make the area more habitable for some New Yorkers and I wish you success in your next endeavour.